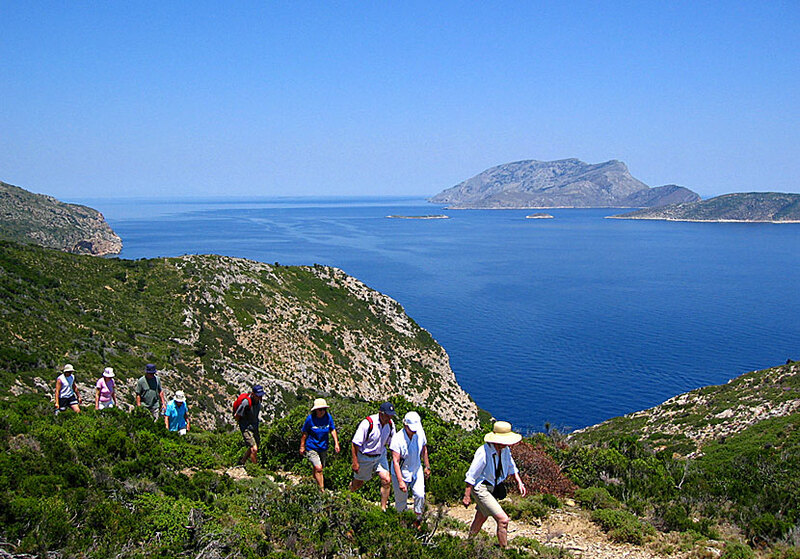 Alonissos is famous since a long time among hikers, the scenic and often untouched landscape invites for long lovely hikes. One must not be an inveterate hiker, there are also simple hikes for those who are not experienced, like the easy hike between Patitiri and Chora. And there are no need to be afraid of getting lost. The municipality has put up information boards with maps of fifteen trails. Hiking signs are available around the island. 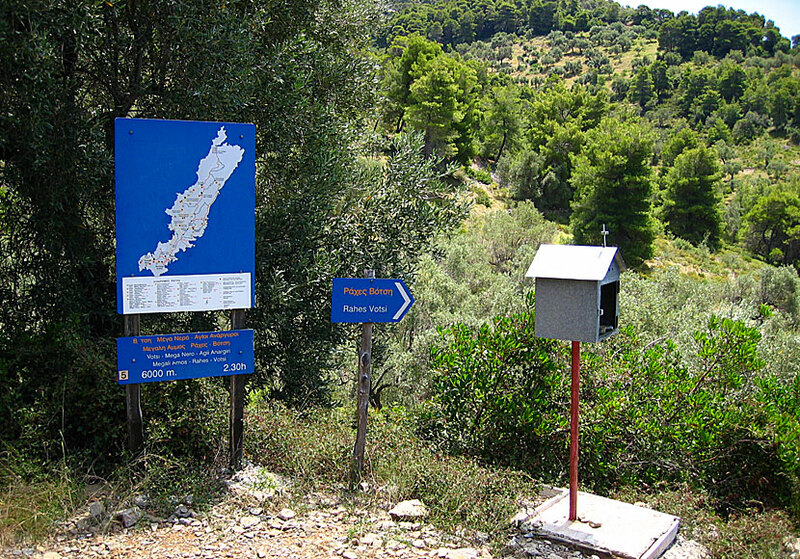 Alonissos on foot is the title of a good hiking book that is available to buy on the island. The book is written by Danish Bente Keller and her husband Elias Tsoukanas. Bente lives on Alonissos since 1995 and she - besides to write about hikes - lead classes in watercolour painting. Hiking on the small island of Kyra Panagia outside Alonissos. If you are going to hike, I recommend Anavasi's blue map (1:25,000), it describes several hikes on Alonissos, both easy and difficult. Terrain maps, also called Skai maps, is another Greek cartographic company specialized in hiking maps. They have a map of Alonissos, scale 1:25,000. It describes numerous of hikes and are available for purchase on the island, just as Anavasi's map. 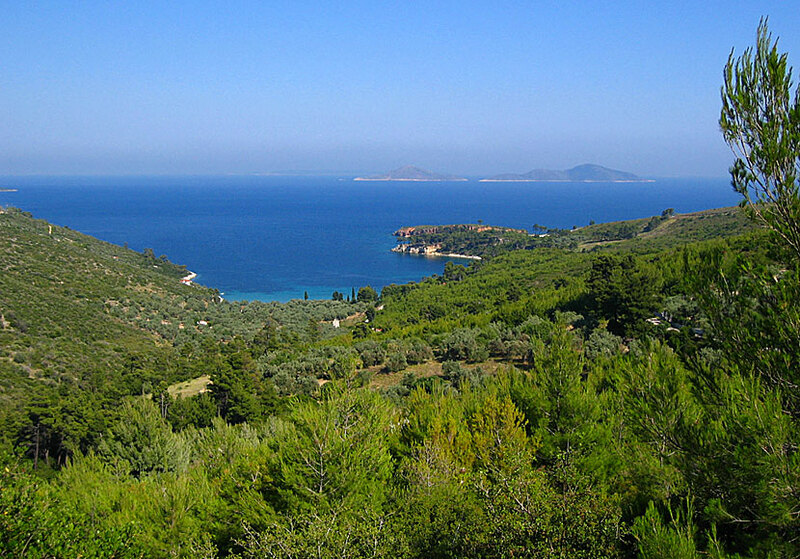 Alonissos offers a very beautiful landscape. Kokinokastro to the right.